Paul Rutkovsky, Professor for Florida State University Department of Art, has created a stir with his Doodle Cart Tour. Featured on the Florida State University homepage, Rutkovsky has been recognized for his Doodle Cart tour throughout Tennessee, Kentucky and Georgia. The initiative allows onlookers to create a doodle using colored pencils, watercolor pens and doodle paper, which will add to Rutkovsky’s exhibition of over 1,000 other doodles he’s collected over the years. With an aim to promote healthy eating, the contributors receive a free organic free in exchange for their doodle donation. 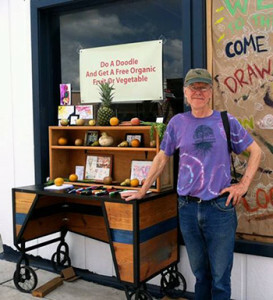 Read the full FSU article “Doodles for food: Professor’s art cart offers organic edibles”. Paul Rutkovsky is a Professor for the Department of Art at Florida State University. Rutkovsky teaches illustration at FSU and to the Tallahassee community. He works with the Art Alleys, cleaning up Gaines Street and has gained increasing popularity with his Doodle Cart. Follow Doodle Cart or The Art Alleys on Facebook.